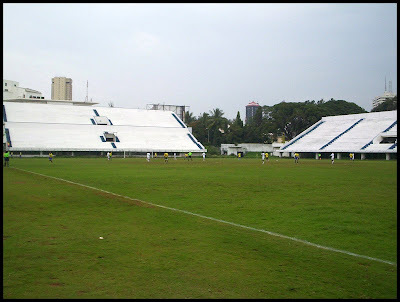 Located right at the heart of the city, Bangalore Football Stadium is perhaps the only football stadium in India which is owned by a state association. In September 2009, as a part of FIFA’s "Win in India with India" initiative, artificial turfs consultant, Dr. Eric Harrison visited the Bangalore Football Stadium on September 17. Dr. Harrison was also accompanied by Chrysantha Perera, FIFA's Assistant Development officer, also the CEO of Football Federation of Sri Lanka selected as one of the venue where the natural grasses would make way for the artificial turf. In the early days, the project was expected to start in January 2010 once the tendering process gets completed, the installation would typically take four months. 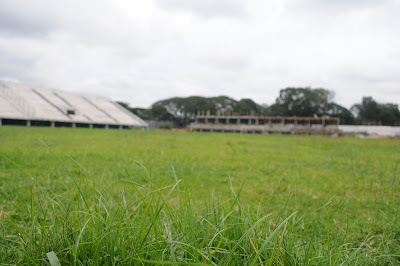 Bangalore Football Stadium hosted the 2010 II Division I-League (one group leg and the final stage) April thru May and the actual work on the artificial turf laying process started only on September 2010. Meanwhile, I Division I-League started on early December. The ground was just not ready and forced HAL to play their first 8 I-league encounters in the away venues. KSFA was expecting to complete the turf-laying project by January, however, could not stick to the plan and HAL suffered by played all their home matches at the sub-standard Sree Kanteerava Stadium, blowing away the home advantage. In February 1, this year, FIFA representative Dr. Eric Harrison inspected the pitch of the Bangalore Football Stadium. This visit was a part of the inspection process deployed by FIFA. The inspection went on smoothly with the consultant expressing satisfaction on the work done till date. The artificial turf was expected to reach Bangalore by February 17 and then another 3 weeks time to lay the turf on the ground. However, pre-monsoon that lashed Bangalore in the month of April further delayed the work. With just a single home match to play in the I Division I-League, HAL has suffered the most in terms of playing in front of a decent “home ground”. Finally, keeping off from all kind of speculations, the ground is all done and the inauguration of the artificial turf at the Bangalore Football Stadium is scheduled tomorrow, Wednesday May 18. Plastic pitches are not good for footabll. I played on Astroturf myself and hated every minute of it. We don't have it in England anymore and I don't think it should be used in a competition like this. So what shall we do, ban synthetic pitches? Where do you draw a line for what is and what isn’t synthetic? Sure every pitch in the Premier League is Grass, but underneath it all is a working machine making sure it works properly. Just keeping a pitch in top condition requires regular watering, under-pitch heating to prevent freezing in the winter, and even the use of high-power lighting rigsto promote grass growth. Its easy for Redknapp to lambast plastic pitches from his thrown at White Hart Lane, but does he think that perhaps some teams inEurope need these pitches because grass pitches simply don’t survive or are far too expensive to maintain, I don’t imagine so. Apparently professional footballers can’t cope with a different surface, maybe it’s because they’ve homed their fantastic skills so much, that the slightest tweak can ruin everything. That their passing is so inch perfect and so precise, that a slight change in surface throws everything off course. Surely its not fair to put such stress and hardship on our hero’s from North London, especially after their miraculous achievements from last season? Nonsense. Last night we saw an over confident Tottenham side blown away by an efficient Young Boys side. For the first half hour, Tottenham’s defence couldn’t stop a thing, and before they knew it, they were 3-0 down. The question here isn’t whether or not the surface played a part in the result, the question is whether or not Redknapp would of brought it up if the game had gone his way. If the surface was to blame, how was it that we saw a different Spurs side in the second half, did they go in at half time, all change to Astroturf shoes and suddenly got their magic touch back? No, Redknapp clearly gave them a piece of his mind, got them focused and they managed to salvage something from the game, regardless of the surface. Spurs now go into the second leg at home, with two invaluable away goals. Back to their fortress where Redknapp is confident his side will perform ten fold and secure a place in the elusive Champions League. And I’m sure they will, because they have better players, a better manager, their a much bigger club, more money to build a squad, they play in a better league and are a much better side than Young boys. Not because they can finally play on grass. There is a very wide range of Synthetic tennis courts grass products on the market now, tailored for various different sports from bowls to equestrianism. Of course natural turf is managed in countless different ways specifically for the sports played on them and, likewise, synthetic turf has been developed with the various qualities required by different sports.